So once again our friend Karl Klein (son of Theodore Klein of Yew Dell) came by with a little surprise for us the other day last week, 5 Wild Turkey Chicks! Karl was out mowing on his farm and flushed a Wild Turkey Hen off of her nest. He didn’t hurt her, but she ran off and from his experience once a hen leaves her nest like that she won’t come back to her eggs. 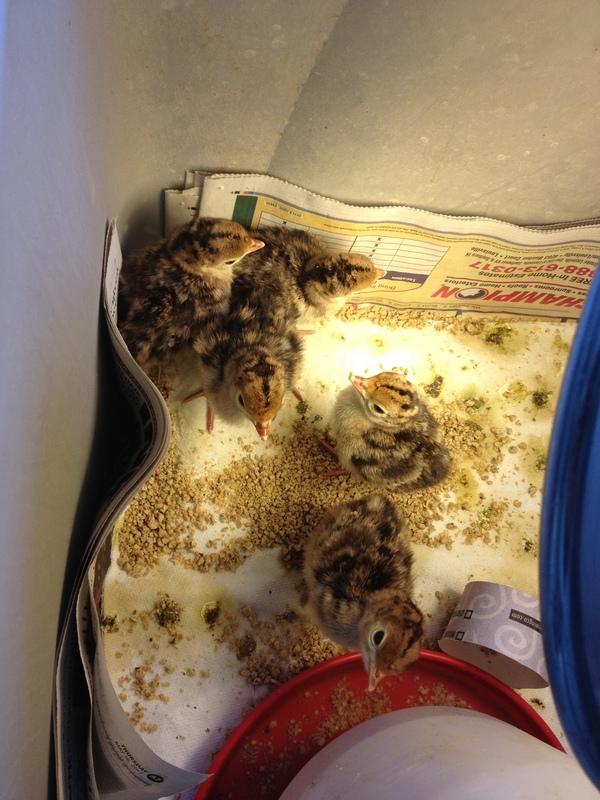 So he collected the eggs and took them inside to his incubator and hatched the chicks (actually Poults). He brought us 5 of these little guys at 2 days old and they have been living in our house (in a box !!) It’s funny, I thought we finally had the animals, other than the dog and the kids, out of the house and here we go again. We got Captain Black Boots, the baby Lamb that Karl brought us and Hope bottled fed and the 9 rabbits we rescued from animal control out and now I have Turkeys!! For more info on Wild Turkeys check out the link below.